The following is excerpted from Uncertainty: Turning Fear and Doubt Into Fuel for Brilliance by Jonathan Fields. (1) Is this good enough? (2) Am I good enough? We are often terrified of getting answers to those questions we don’t want to hear. This aversion to being judged, to being told something doesn’t measure up, leads you to cut creative quests short or, worse, never even begin. That alone is a tough enough challenge for the creative soul who typically spends a good chunk of time pining for acceptance. What if you lust after the quest to create but have not yet discovered how to lean into the fear? Can you teach yourself to be a fear alchemist and, in doing so, develop the ability to tap into the fuel side of fear to create on a whole different level? Yes. There are practices and changes in your environment and process that can help. One of them I call certainty anchors. A certainty anchor is a practice or process that adds something known and reliable to your life when you may otherwise feel you’re spinning off in a million different directions. Rituals and routines can function as certainty anchors; their power comes from the simple fact that they are always there. They are grounding experiences to which you can always return, no matter what’s going on. Their consistency makes them effective tools to counter the anxiety that comes not only from living in uncertain times, but from embracing endeavors that ramp uncertainty even higher. For the creator, whose very existence depends on the ability to spend vast amounts of time living and operating in the ethereal sea of uncertainty and anxiety that is creation, rituals in every part of life serve as a source of psychic bedrock. They provide just enough of a foundation to allow you to free up that part of your brain that needs permission to run unencumbered in the quest to create the greatest possible something from nothing. Some of the most creative people in the world are attached to rituals and routines in their everyday lives. Professional blogger Darren Rowse starts each day by heading off to his favorite cafe, ostensibly to find a good place to write, but there’s a lot of ritual in that as well. Broader lifestyle routines serve as a salve to calm a bit of the anxiety of creation and to drop an anchor to which we can tether our creative lines, knowing we can float higher up into the clouds and stay there longer, trusting that we’ll be able to find our way down. 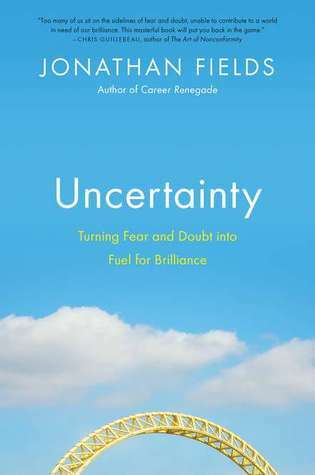 Excerpted from Uncertainty by Jonathan Fields by arrangement with Portfolio Penguin, a member of Penguin Group (USA), Inc. Copyright 2011 by Jonathan Fields. Fields writes about entrepreneurship, innovation, lifestyles, and marketing at JonathanFields.com and TribalAuthor.com and contributes to PsychologyToday.com and OPENForum.com. Posted in Creativity + Inspiration, Guest Post, Writing Advice. Jonathan Fields is a dad, husband, New Yorker, author and speaker, serial wellness-industry entrepreneur, recovering S.E.C./mega-firm hedge-fund lawyer, slightly-warped, unusually-stretchy, spiritually-inclined, obsessed with creation, marketing and innovation consultant, venture partner and book-marketing educator. Lots of food for thought there. We like routine, but abhor it when we see it dragging us down. Taking chances in life can be freeing. I take my chances no matter what others say. I have come to the realization that nothing good comes easy and to be successful you must be ready to take risks. There are those who hate the idea of success so why listen to them. In the movie HIMALAYA, the monk Norbu says his teacher told him that when two paths open before him, he should always choose the riskiest one. The whole plot of the movie turns on that sentence. I’ve taken on several new projects recently that have left me spinning like a top. I love routine! Why do I forget that? Great post. Jane – Thanks so much for sharing this excerpt with your great tribe. And thanks to everyone for your comments. Uncertainty isn’t an easy place to be, but it’s a mandatory part of the quest to do great work and create great things. Our job is to learn how to create uncertainty scaffolding that allows us to be okay there. This is the entire subject of Lynda Barry’s What It Is. Yes creative people practice a lot of routine behaviour. But how about normal people? A friend of mine always order the same food and drink in the restaurant, but he is not a creative person. It’s precisely because of his afraid of risk taking that he eat the same thing everyday (he is afraid that he ordered the food that he does not like, and so wasted the money). So, when you’re looking for patterns in creative people, look for those that are rare among normal people.